Existing home sales are up 3.4 percent over the same time last year, according to a recent report by the National Association of Realtors® (NAR). Helped by the $8,000 tax credit to first time buyers, existing home sales are on pace to reach 5.1 million units for 2009, up from the 4.93 million units projected in August 2008. "Home sales retrenched from a very strong improvement in July but continue to be much higher than before the stimulus. The first-time buyer tax credit is having the intended impact of bringing buyers into the market, allowing them to take advantage of very favorable affordability conditions,” said Lawrence Yun, NAR chief economist. 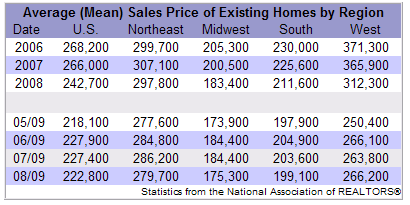 Although existing home sales are up from this time in 2008, the overall numbers are down from just one month ago. "The decline demonstrates we can’t take a housing rebound for granted," Yun said. In the previous four months, sales had risen over 15 percent. Low mortgage rates have contributed to the overall market rise. Freddie Mac reported an average national commitment rate of 5.19 percent in August for a 30 year conventional fixed rate mortgage, down considerably from 6.49 percent offered in August 2008.